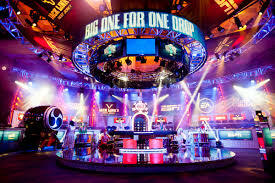 The World Series of Poker’s (WSOP) mega buy-in charity event, the Big One for One Drop, will return in October with a new and improved format. The brainchild of Cirque du Soleil owner and philanthropist, Guy Laliberté, the $1 million Big One for One Drop set the poker world on fire back in 2012. Welcoming 48 players and generating a top prize worth $18,346,673, the tournament was a huge success and was eventually won by Antonio Esfandiari. Two years later the WSOP repeated the feat and raised more money for One Drop with a second $1 million buy-in event that saw 42 players join the action. With another two years down but no mention of another $1 million charity event, some players were starting to wonder where the seven-figure spectacle was at. Fortunately, just as the WSOP is drawing to a close, Laliberté popped up to announce that the Big One for One Drop will be back in October, but not as we know it. Unlike the two previous events, the next Big One for One Drop won’t cost $1 million and it won’t even take place in Las Vegas. This year, the new look Big One for One Drop will form part of a week-long festival in Monte Carlo. Designed to raise more money for One Drop, the Monte-Carlo One Drop Extravaganza will take place in the Casino de Monte-Carlo between October 13 and October 17, 2016. As well as cash games and side events, the main event will be a €1 million ($1.1 million) re-entry event. But wait, that’s not all. As well as a venue change and a price increase, the new tournament will be for “recreational” players only. In a bid to attract more media interest in the tournament, a combination of businessmen, celebrities and philanthropists will be invited to take part. “Our vision is to broaden the appeal by creating a tournament that is both ultra-exclusive and lots of fun,” said One Drop CEO, Catherine B. Bachand. Naturally, to ensure this an event worth watching, professional players will be allowed to coach the entrants who will all enjoy a luxury trip to Monte Carlo as part of their buy-in. The decision to make the tournament an all-recreational affair will certainly disappoint some players who will no doubt see a lot of value in a $1.1 million buy-in event filled with amateurs. However, it’s certainly a sign of the times. From PokerStars signing soccer stars as brand ambassadors to the Global Poker League rolling out The Cube, poker is finding new ways to appeal to the masses. The next Big One for One Drop will certainly be another step in that direction and it should be interesting to see whether the theory matches the reality.